Theodora, the 4th Marchioness of Bristol, recorded the 1910-11 restoration of the church. You can see a facsimile of the book by asking one of our volunteers in the church – it is available for view whenever the church is staffed. This is the most recent inventory of burials in the churchyard. 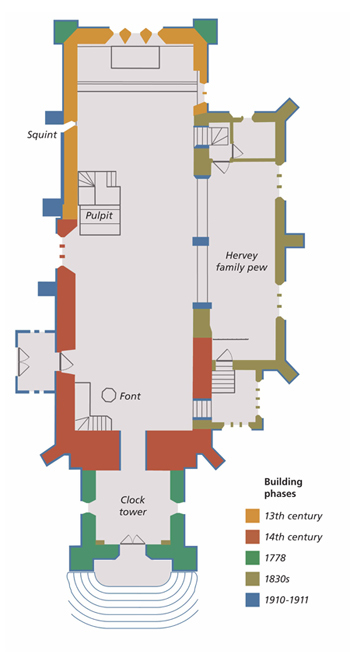 Further information about those baptised, married and buried here can be found in Ickworth Parish Registers: Baptisms, Marriages and Burials 1566 to 1890 by Sydenham Henry August Hervey (Kessinger Legacy Reprints). The internal workings of the Thwaites & Reed clock, made in 1833, were restored in 2012-13 by A. James (Jewellers) Ltd, of Saffron Walden. The tower clock face was removed, restored and regilded in the 2012-13 restoration.